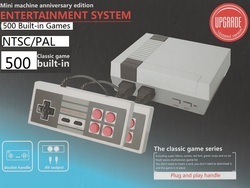 Home › Video Game Consoles › GRITZEST Mini TV .. Note: We don't send the package box, because it is heavy and shipping cost is higher. If you need the package box, please contact us and pay an extra 4 dollars for it. 2. 500 different built-in NES games. Game list is in the following picture. 5. Compatible with gamepads of the same kind. Copyright ©2019 Game Ware Online Store. All Rights Reserved.